Mr Tabubil and I have just returned from three weeks holiday – a week in Holland, so that I might see a bit of his country and meet his family, and two weeks together after that in Italy. Right now we’re in Holland. Train stations in Holland have more bicycle parking that I DREAMED possible – even after half a week in Holland. 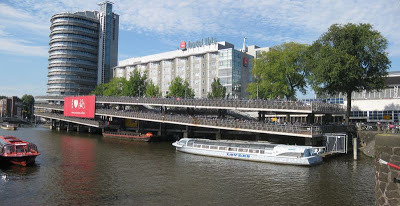 Example: the bicycle parking-facility outside the central train station in Amsterdam is a four storey structure - it holds thousands of bicycles, parked handle to handle, seat to seat, and double-decker and every single one looks identical; the feats of memory that the average Dutch commuter performs on a twice-daily basis are PRODIGIOUS. The bicycle-parking facility at the central train station in den Hague is somewhat more modest. But large enough - we watched an elderly couple, combing through one level of the bicycle garage, then climbing the ramp to the level above and searching through that. They decided that they must have been mistaken, and climbed back down the ramp to the lower level and went through it again, bicycle by bicycle – we had to go and catch our train and couldn’t stay and watch. I imagine that they’re still there.